Just because you don’t see something very often doesn’t mean the world is ending. Perhaps some of the people who saw this rainbow cloud formation would do well to remember that. 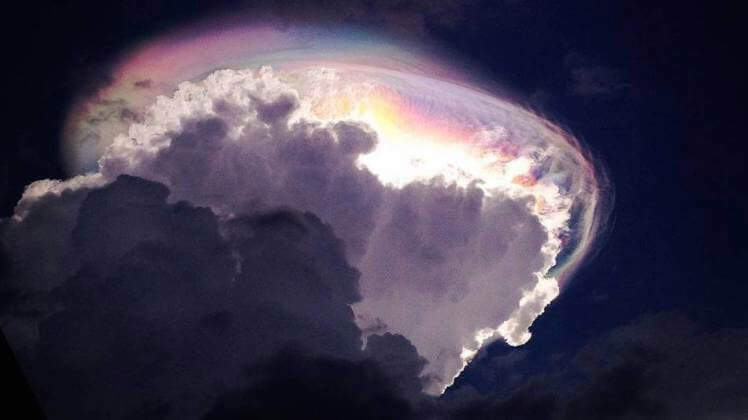 A phenomenon known as a ‘pileus’ or ‘cap cloud’ seen above Costa Rica prompted doomsday predictions, cries of ‘aliens!’ and a number of other equally unlikely speculations. A relatively rare cloud formation caused an online sensation in Costa Rica on Tuesday. The rainbow cloud formation was captured by eyewitnesses on the ground and touted as “the end of days” and a “sign of God” by some online. Surprisingly, the cap cloud is formed not by the hand of extra-terrestrials but by the rapid ascension of a thunderstorm or shower, which causes the air above to rise, cool and condense into a cloud that resembles a cap, hence the name. In this particular example, the cap cloud included ice crystals, and when light from the sun hit the ice crystals it refracted and made a rainbow. In order for this to occur the sun usually has to be low on the horizon.